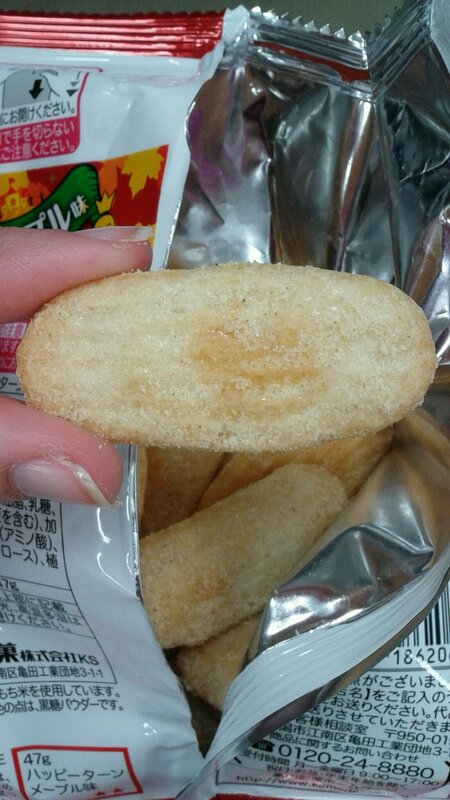 ハッピーターン or Happy Turn in plain English, is one of my favourite snacks here in Japan. It’s really hard to describe what it is, but you could say it’s a rice cracker with a special “happy powder” coating (their words, not mine) sprinkled on it. The plain ones are available all year round, but every so often they release different flavours. 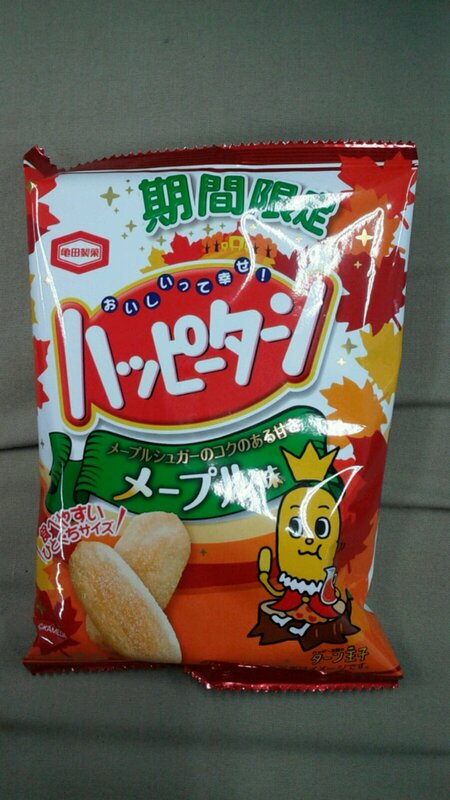 I tried the vanilla flavoured one earlier this year, and for autumn they’ve released a maple flavoured one. It tastes of maple syrup, and it’s scrumptious. I really like it, just as I’ve liked all of the Happy Turn offerings so far. But then again, I actually do like rice crackers. 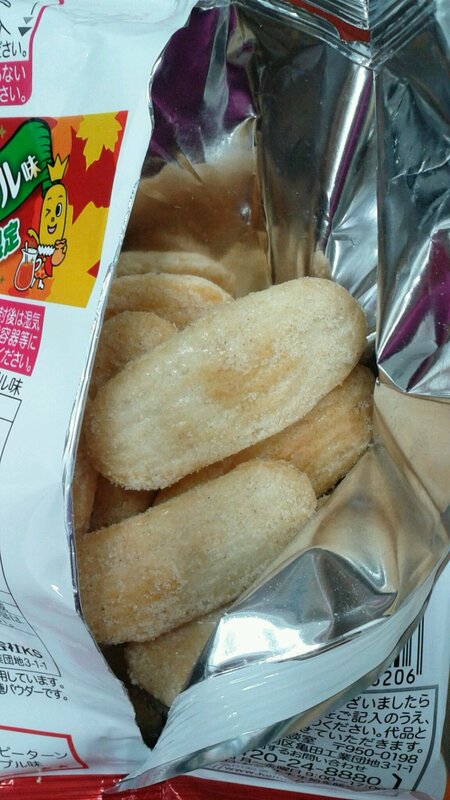 I know there are some people who can’t stand rice crackers because of their pungent smell, but I don’t mind it at all. You can always tell when someone is eating senbei because you will smell it first. It’s an indescribable smell, perhaps akin to Marmite. Now, I don’t love Marmite, nor do I loathe it – I can eat it if I must, especially when paired with cheese in a sandwich. Perhaps that’s why the smell doesn’t bother me at all. If you don’t like rice crackers, you probably won’t like this snack. But if you’re one of the fortunate ones, this really hits the spot when you want something crunchy to munch on. The pack is a good size for portion control, and the little mascot, Prince Turn, looks pretty content while sitting on a tree stump with his crown perched jauntily on his head, munching away quite happily on Happy Turn snacks with a jug of maple syrup in one hand and a cracker in the other. Add to that the autumnal packaging and it’s really hard to resist this seasonal snack! Once you’ve started eating, you can’t stop until the last one is gone. I don’t even share them at work, I just gobble them down. Have you tried them before? How do you feel about rice crackers? Miranda Kerr always says that she likes rice crackers when she’s being interviewed over here, and it makes Japanese people so happy. They love her! Hope you’ve all had a marvellous weekend. Cheeky wink from the Prince. Heheh 🙂 I did actually! The one where the police come knocking, right? They were so good! Actually, British adverts are awesome 🙂 I’ve shown my students the meerkat ones, as well as Churchill and Paddington Bear’s marmite ones. They thoroughly enjoyed them.